While I continued to make the argument that the last 11 days contained over 50 "events" and could be considered the March substitute for the real Philly Beer Week, the "official" Philly Beer Week(end) kicked off on Friday. Not content to wait, we joined the Rob Tod traveling party when it stopped in at Teresa's Next Door on Thursday night. The caravan apparently had been sticking pretty well to its schedule after having already conducted a brunch in the city at Jose Pistolas and then an early happy hour free tasting at Beer Yard. We showed up about half way through Rob's two hours at TND before he headed off to Craft Ale House. 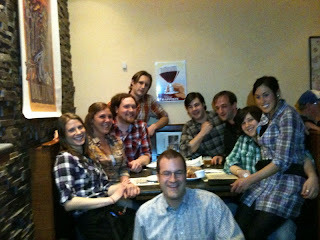 Since I missed out on taking my own picture, Andy forwarded a copy of the flannel-themed picture that they took earlier during the visit. Funny how, I no sooner get home and see that Jack already has a posting about the event that he didn't attend. Somehow, he just "phoned it in" and a copy also wound up in his inbox. Funny, I have so much to learn from this guy. To not even attend the event, to be waiting perched by the computer at home for the incoming, and to have some blurbs posted about it before the event even ended is a true testament to this man's greatness (and the telecommunications age, too, I suppose). Once again, big name, big bucks. So I did have one of my own pictures to add to the pile and to prove that I was indeed there. The tap list. Kind of boring I'm sure (that of the non-action picture, that is), but it does prove to be quite a nice picture of more Allagash than I'm sure just about anyone has ever seen. Oh...and the Bourbon Black? Very, very nicely done where the bourbon is noticeable but does not play the leading role. Presumably, all went just about the same, save for a few less drafts, at Craft Ale House where Rob rounded out his day before turning in for a 7:30am flight back to Maine where he was due back at work Friday morning. All in a day's work for a Rock Star Brewer. Remember how I've said that every neighborhood should have an "Earth Bread + Brewery"? Well, that goes for malls and brewpubs too. Every mall should have a "Rock Bottom Brewery + Restaurant." Of course, going to the mall and not stopping at the award-winning brewpub is just simply not an option. But, we opted not to dine there. Instead, we sat the bar where Patty had the Liquid Gold (hefeweizen...not too estery, nice.) and I had what probably is my favorite beer of their's: the Prussia Pride IPA. Better yet, I had the cask-conditioned version. What a nice, nice experience. I love IPAs like this. Relatively low ABV (compared to the big boys ahead of me later in the weekend, this one, I believe, clocks in just over 6%) and a great balance of hops and malt. We sipped our beers while we decided on dinner at Legal Sea Foods. Out popped the phone to make a reservation through OpenTable...ah, yes these wonderful digital days! There's not much beer-y to report from Legal Sea Foods. They do have something from Harpoon and Sam Adams of course. I say, of course, because they're a New England-based company. But, in addition to the less adventurous beers, our waitress mentioned the new Noble Pils from Sam Adams. It's one that I had to pass up at Chicago's O'Hare airport because I spent too much time flirting with Matilda (come to think of it, I haven't yet shared that story with you). Noble Pils. Very nice and clean and crisp and just what I want a Pilsner tasting like. Then came the big day: Saturday. Once Patty and I decided that we would drive to the city together (after much debate about drive, train, together, separate), we strolled in to Kite & Key at 11:01am just in time for Jim Kirk to hand the first glass of Johnny Cask 75 Minute IPA (oops, that's not the officially registered name) to me. And, with that, Philly Beer Week(end) was officially underway. The first bus showed up less then 30 minutes later and from what I could tell, this bus thing was pretty well organized. At each place we stopped, we seemed to see the buses every 20-30 minutes. Over 200 people had signed up ahead of time on the website and another 100 or so bought bus passes day-of. Good thing, these buses, because with the weather pouring down cats and dogs, cabs were in very high demand and with parking, you certainly wouldn't want to walk very far. After a dip into Bear Republic's Apex (please, don't tell anyone just how very good this beer is. please, let it continue to fly under the radar away from the uber-geeky hop beers), we headed out to Brauhaus Schmitz. When we left Kite & Key, they were nearing seated capacity and the excitement level seemed to grow by the hour. Finally, this would be my first visit to Brauhaus Schmitz, after hearing scores of good reviews from others. Anyone who's already been there knows that Doug and Kelly have pulled off a very good beer hall at 7th and South Streets. We grabbed a table and met up with our niece and dozens of other beer bus expressers. We figured after a couple of DFH and Bear Republic beers at Kite & Key, that a stop at Brauhaus Schmitz for a solid lunch a relatively lower strength beers would be a wise idea before heading off to Sidecar's Double IPA event. The buses came and the buses went, each dropping off a dozen or so partygoers. The Kölsch went down real nice and easy, with a noticeable but definitely subdued fruitiness in the finish. Very mild on the hops too. This should be crowd-pleaser, particularly as the weather warms through the spring into summer. A firkin of Stoudt's maibock on the bar was a not-to-miss beer as well and served well as an opening beer before we ordered. In between, I couldn't refuse a Schlenkerla Fastenbier on draft. What a great beer, provided noticeably smoked malt beers are your type of thing. They need to be your type of thing, because the memory of the smoke still hung with me even after a couple of double IPAs at Sidecar. To close out our visit, I opted for another glass of the Kölsch, this time in the smaller and lovelier Lorely glass. The rest of the beer menu at Brauhaus Schmitz is a good study in German beer, with a nice dash of Belgians thrown in the mix as well. Next up, as my comments thusfar have alluded to, we headed cross town to Sidecar at 22nd and Christian streets. This was only my third visit to Sidecar, but the experience was much the same; Or maybe that's because each time I've gone it's been for a "special event." Let's see, once for Sly Fox, once for New Holland / Arcadia, and now once for a piece of their weekend-long double IPA fest. Crowded, loud, great beer, fun. Nothing wrong with any of that I suppose? The day prior they had Pliny the Younger on tap, fresh from its banishment from the PLCB's website of registered brands. The sixtel kicked in under 45 minutes according to co-owner Adam Ritter, who was helping to man the bar on Saturday afternoon keeping folks thirst for hops sated with the likes of Pliny the Elder, Southern Tier Gemini, etc. We only stayed for around an hour before heading back out to stop in and remind our dogs that we love them. Then it was off to The Drafting Room. Why, you ask? Well, there was another gathering of hops-crazed beer groupies and it seemed like the right thing to do. The crowd had been thicker, but it was still standing room only when we arrived. The usual antics were being poured and discussed, but one little thing bears mentioning. A new beer was introduced to me and I'd like to ask a favor of you. Don't tell anyone about this "Belgian IPA" from the next door Netherlands, of all places, called Emelisse Double IPA. This could be in the running for top 10 new beers introduced to me in 2010. I'm busy with getting this and other things done, so I won't bother to try and research this to find out more of what this is all about. But, in the meantime, I've given you fair warning that it's at The Drafting Room for a couple of more days, best guess. Don't be surprised to hear of me stopping back in there by midweek for one more taste. It's not cheap, but the good stuff rarely is. Like I said, let's keep this to ourselves. So after some good times, good beers, and good laughs Patty and I decided that The Brew Lounge didn't need any more material for one day. But, as some days tend to go, a text message from a good friend came in when we were just a couple of miles from home. "You guys around? We're at the Pig." Seeing this as an occurrence involving these friends that rarely happens, we kept the wheel of the car straight, called the dogs and told them to hold on for another hour or so, and headed up the hill into Malvern. The craft beer story ends there. Of course, there's the usually decent draft and bottle list at the Flying Pig. And the usual antics that can only be seen and heard at establishments like the Pig. But, this was off the Philly Beer Week(end) radar, the number of beer geeks in the house was very evidently low, but that all worked out just fine. All in all, Philly Beer Week(end) proved to be a nice March tune-up. Exploring the city in nasty weather (recall the Nor'easter on 3/8/08, the first Saturday of the first Philly Beer Week?) Just like you remember the bars you went to in the big nastly blizzards, or things that happened during hurricanes, etc. Everyone will remember riding the bus around the city on Saturday, swimming into the Brewers Plate on Sunday, et cetera and whatever you did and wherever you went. Unfortunately, though, there's a bit of collateral damage that occurs on weekends such as this. Something had to give...fall by the wayside. In this case, I was disappointed to have skipped the first annual cask ale festival at General Sutter Inn. They had 22, or 23, casks of "rare and interesting" beer. Patty could tell you how many times on Sunday I said, "I've changed my mind, I'm going to General Sutter." They wouldn't disclose a list ahead of time. Don't know if that had anything to do with the current PLCB debacle, or otherwise. In any case, between Paul Pendyk and Alex Hall running the event, I can't imagine it being anything other than a wise choice of an event to attend this weekend. I closed out the weekend with a bowl of my homemade scallop and potato chowder. I'll have a word or two to say about that under a separate posting.